Modern Exteriors of Springfield proudly offers low-maintenance replacement windows to homeowners throughout the Four State area. Our company offers products from several exceptional brands including NT Windows, Andersen, Marvin, and Weather Shield, to give customers a wide range of options to choose from. Our selection includes a variety of durable vinyl windows, aluminum-clad wood windows , and all-wood windows, with finishes to suit the interior and exterior looks of virtually any home. You can also find options in a range of styles, including casement, bow and bay, sliding, double hung, and garden, making it easy to find the perfect replacement windows for any part of your home. Modern Exteriors also provides the professional installation services you need to ensure that these replacement windows look beautiful and perform their best. Our installers are factory trained to fit these windows with exceptional attention to detail and all their work is backed by a two-year labor warranty. We also pass on the manufacturer’s warranties for all of our home windows, further protecting your investment. With a variety of financing options available for qualified buyers, they can even be easy for you to afford. Contact Modern Exteriors today to learn more about our replacement windows for Springfield, MO; Joplin, MO; Mountain Home, AR; Pittsburg, KS, and other nearby communities. 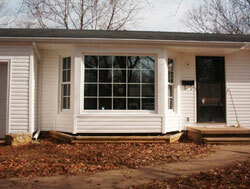 Be sure to ask about our other low-maintenance home improvement products like siding, sunrooms, decking, and gutters.